Other glass tools may remove laminated glass, but they potentially sacrifice patient safety and precious time. The RHYNO Windshield Cutter™ is a unique, battery powered hand tool utilized to safely and rapidly cut laminated glass in motor vehicles. The RYHNO Windshield Cutter™ was specially designed with three primary goals in mind. By September 2017, the United States Code of Federal Regulations requires all motor vehicles to have laminated window glass. This was implemented to prevent full or partial ejection. This critical change requires an advanced glass management tool that can safely access patients with speed and dexterity. There is no tool on the market that can get the job done as safely and quickly as the RHYNO Windshield Cutter™. 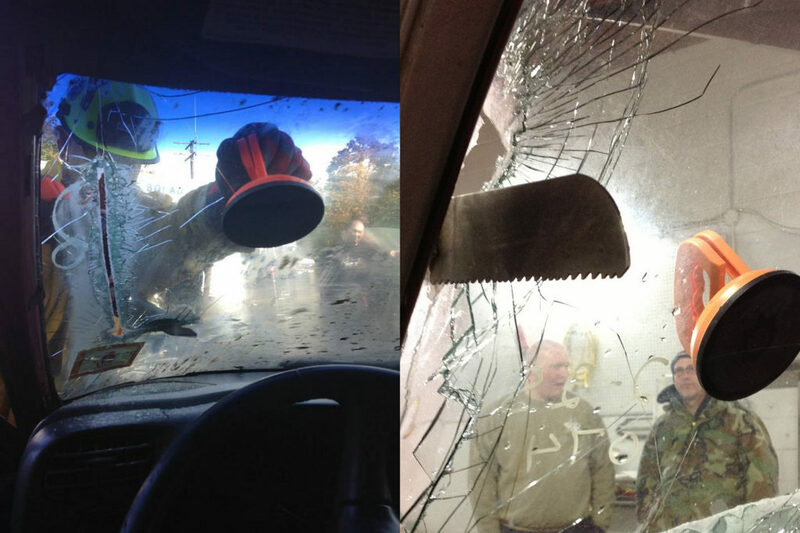 When motor vehicle glass is cut, particles are generated which increases the risk of additional injury to the patient. The RHYNO Windshield Cutter™ blades protrude less than1” into the occupant compartment, significantly reducing the risk of patient injury. Also, the RHYNO Windshield Cutter™ dynamic blade cuts on the upstroke, directing the majority of glass debris upward and outward, ejecting it out onto the windshield and moving downward. Airborne glass dust is minimized with the RHYNO Windshield Cutter™. Often patients are near, against, or even impaled within the glass. The last thing these patients need to worry about is further injury. The RHYNO Windshield Cutter™ blades can be run directly against the patient’s skin with remarkable safety. Patients will simply feel a minor vibration as they are cut free. Because of the consistent cut, the glass edges are fundamentally smooth which drastically reduces the risk of laceration. Not only does the RHYNO Windshield Cutter™ minimize the risk of injury to the patient, but user safety is greatly enhanced as well. During use, if the cutter blades inadvertently come into contact with user’s body or equipment, the risk of injury or damage is minimized. Even the most inexperienced operator can remove a windshield in about 1 minute, safely and quickly without the risk of injury to himself or the patient. Likewise, if rescue personnel accidentally contact the cut edges of the glass during further procedures, the risk of laceration on the cut edges is minimized. The RHYNO Windshield Cutter™ can be used with one hand, making it ideal for rollovers, under/over-rides, and situations with limited leverage opportunity. The RHYNO Windshield Cutter™ is easily controlled to cut tight corners, as well as affording precision cutting with great maneuverability. Staying within the Golden Hour means every second counts. 1st Responders like you must use all available means to get your patient out. The RHYNO Windshield Cutter™ was specifically designed to safely remove a motor vehicle glass in less than a minute. With a low working profile coupled with easy control, the RHYNO provides quick patient access without sacrificing safety, regardless of the user.